I went into the weekend on the back foot. I was not able to get the CBR sorted in time so had to fall back to the trusty SV650. I filled the bikes radiator with water, put some fuel in the tank and the tyre warmers on last years tyres then rode the wheels of it. I had a great time racing the 600's and achieved some fairly reasonable results. I had plenty of scraps and actually came out in front in some of them. The bike felt great considering I haven't touched it since last year. I qualified in 9th place and even managed to be the pole sitter for one lap :D In race 1 I bogged down the bike off the line and I dropped back a few places, I finished in 11th place. I lined up on Saturday afternoon in 10th place and with a great start I managed to get into fourth place, I held that position for a lap and then we had a red flag. 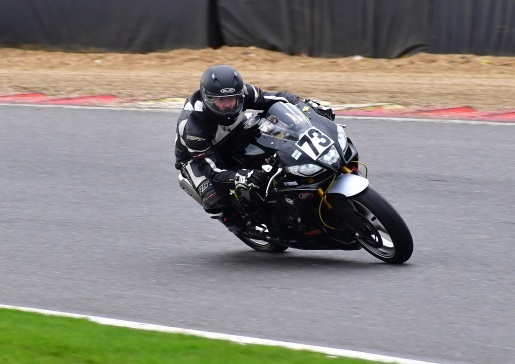 A friend on the grid had a bike issue and crashed at Paddock hill bend with very little breaking from 120mph+. He broke his collar bone but is ok, considering. We lined back up for a second start and I got the worse false neutral off the line, needless to say I did not achieve 4 place after that start. The race was uneventful and again the bike worked great I ended up finishing in the same position I started in, 10th. Sunday morning started out wet, fortunately I had a few hours until the first race which gave the track time to dry. I started the first Sunday race in 14th, set from my 14th fastest time in the last race on Saturday, I had a good start and managed to battle my way up to 10th place. The second and final race on Sunday saw me line up in 4th on the second row of the grid and my best ever start position. The race went well once I had got past the second corner where I nearly clipped the rear wheel of the rider in front, I finished the race in 6th position I lost places to the faster 600 bikes. I improved on my best ever lap time of Brands Indy with a 54.1 second lap. On a downside the bike was dyno'd and has lost power, it now only has 72hp which means even more than before I need to get the 90hp cbr fixed. Oulton park is next on the 29th, a personal favourite of mine and I'm hoping to improve on my laptime there. I will probably be on the SV again battling tooth and nail.